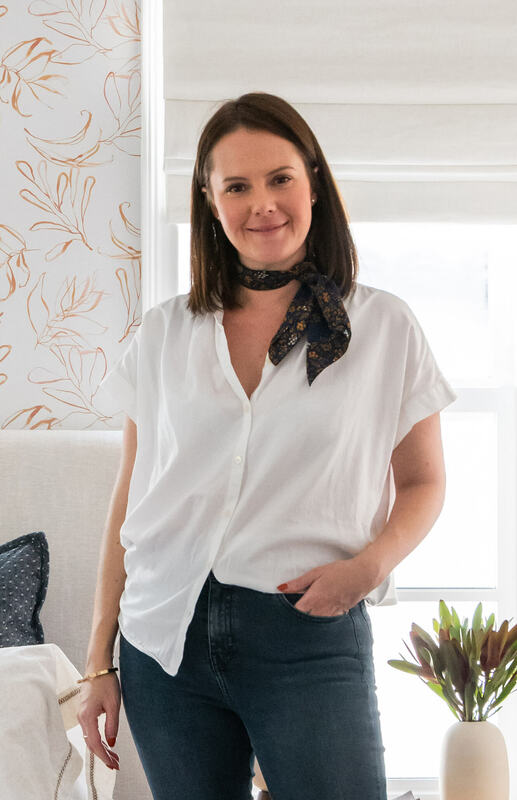 I’ve know Sara, founder of Lulu & Georgia for a few years now, having initially met when working on her first nursery with Emily Henderson. Following the reveal, we remained in contact and collaborated on a couple of projects and shoots for L&G, one being a product holiday shoot at my house. About 6 months ago I met up with her for lunch and she told me she was on the hunt for a new house and fast. She was pregnant again and wanted to be in before the new baby arrived. At the time I offered to help her with the design not thinking she’d actually take me up on it. I was thrilled! The first priority… the nursery. This is baby Max with his sister Vivian. If you meet her and you’re wearing nail polish she’ll be sure to compliment you on it. She cracks me up with her wit and sass. Cannot wait to show you what we have in store for her new bedroom. For the nursery we wanted to create a space that wasn’t too kid-like but felt sophisticated and more classical in it’s style. The inspiration started wth the wallpaper. 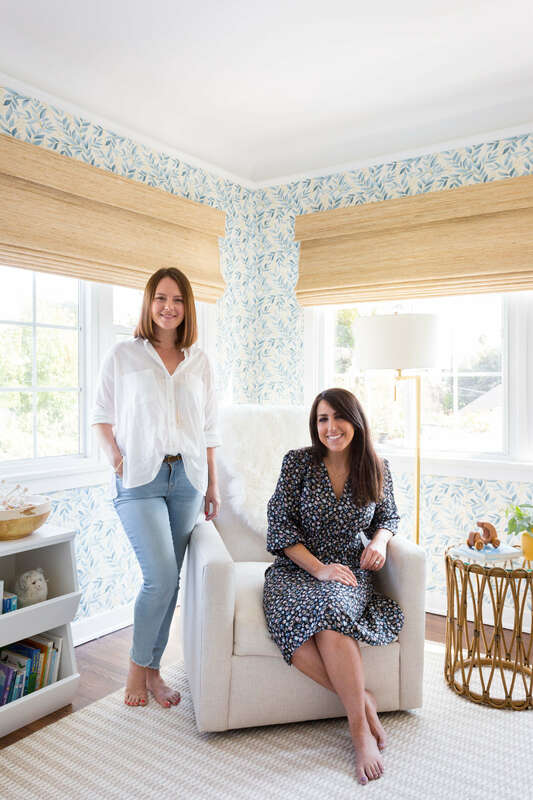 Sara and her team wanted to design something that felt traditional, a bit whimsical, and was also in-keeping with the Spanish-style house. 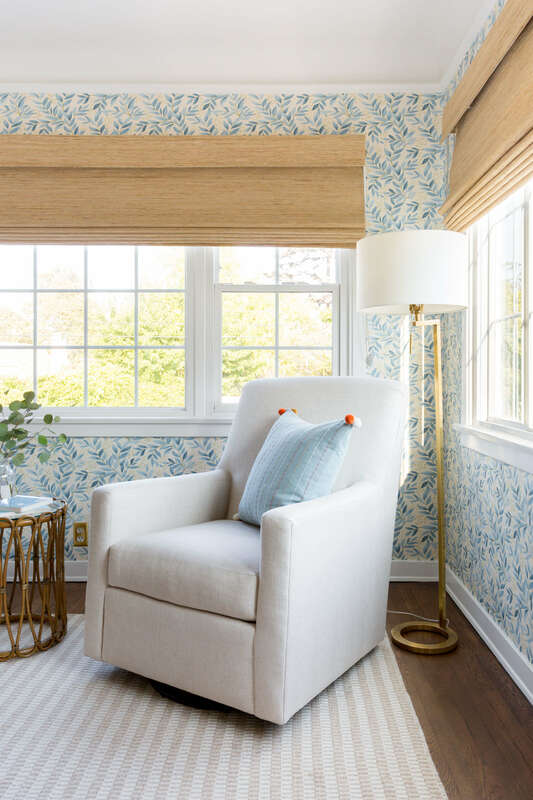 I’m known for my use of blue in interiors so when Sara showed me the initial designs for the wallpaper I was pretty excited about the direction. 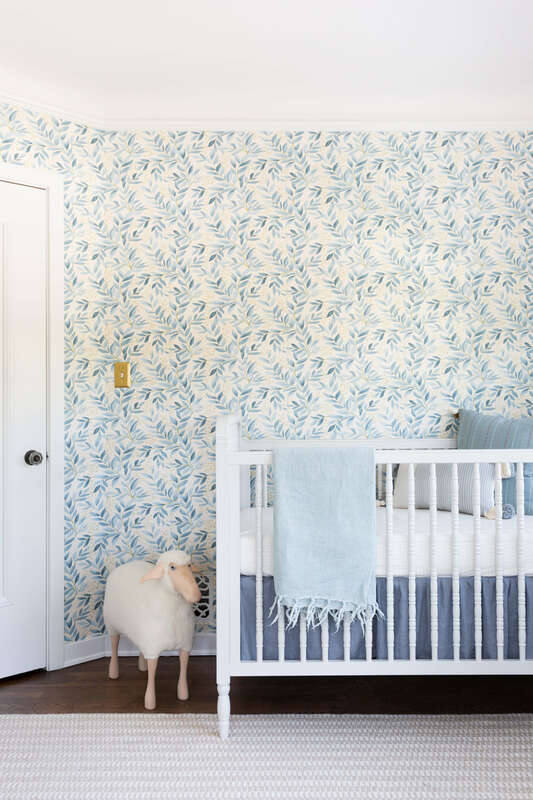 The tones within the wallpaper lend themselves to a younger environment without feeling too child-like so that it wouldn’t feel out of place in a more adult space. We kept all other pieces in neutral tones to keep it feeling fresh. The glider has clean and simple lines and we used a kid-friendly linen for the upholstery, a must when opting for a lighter colour. 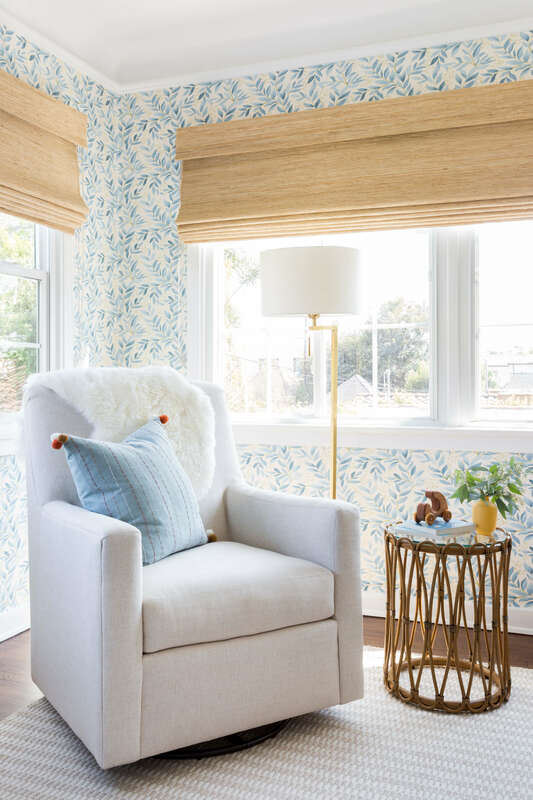 The woven elements such as the shades and side table bring in warmth and speak to a Colonial English meets SoCal vibe. The windows in the room are particularly large and south-facing so there is a constant stream of light coming through all day long. Which is part of the beauty of this room but also tricky when doing the custom shades as woven shades only come in certain widths. With this being a kid’s room you don’t want to have any gaps and want it to be as blackout as possible. We really didn’t want to do drapery (which is better for blackout) as that would have made the room feel fussy. I’m not a parent myself but when designing a nursery you don’t need to create as space that feels themed with characters or that feels too young. 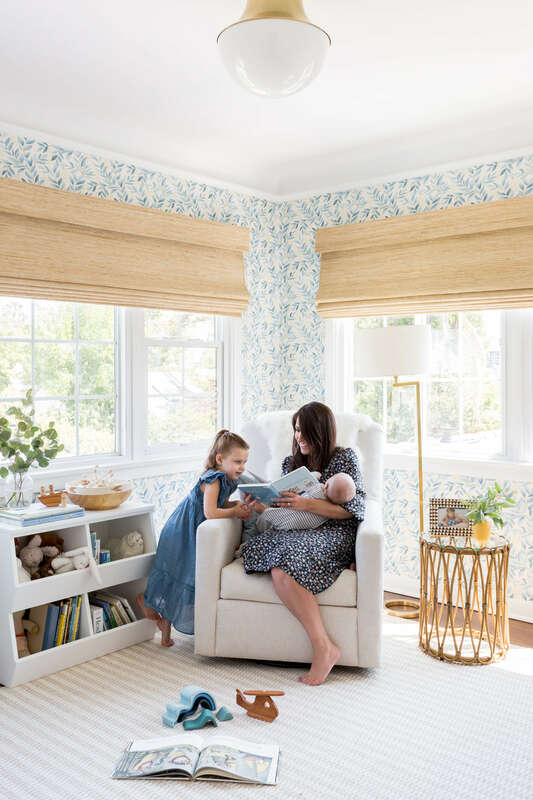 Think of the room as an extension of the rest of the house and something the child can grow into over time. 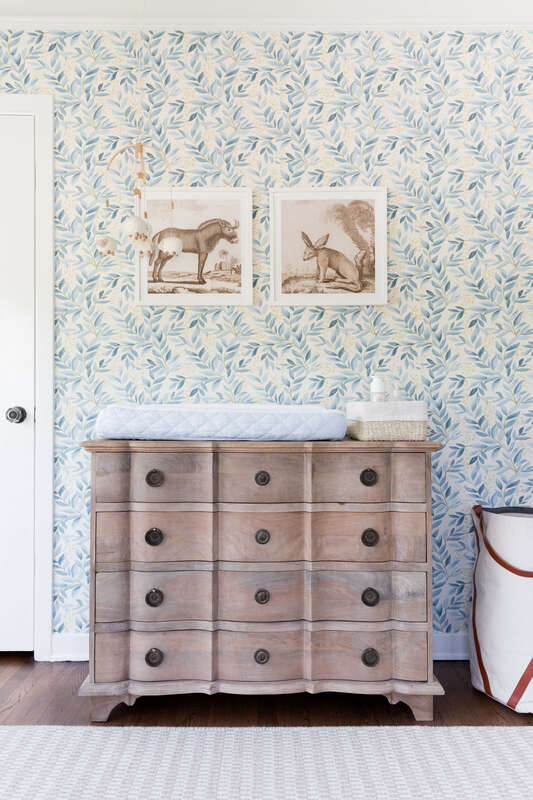 It’s definitely not new to nursery design but instead of using a standard changing table we opted for a more traditional style wood dresser. This added another level of sophistication to the room and something that won’t need to be swapped out as Max gets older. We wanted to add a bit of the Vivian’s old nursery in here so we used the sheep mobile that used to hang over her changing table. Ever since I’ve known Sara she has been obsessed with the Lalanne sheep. We even tried to get one for Vivian’s nursery but couldn’t find one we liked. Lulu & Georgia now stocks them using real New Zealand wool for the body and hand carved wood for the face and legs. It’s the perfect piece to start a family heirloom. The wallpaper has an English Heritage vibe which I obviously love and could envisage in a stately home in the UK. It’s by far my favourite element in the room along with the rug. Both are small patterns but the neutrality of the rug works in harmony with the whispering leaves.